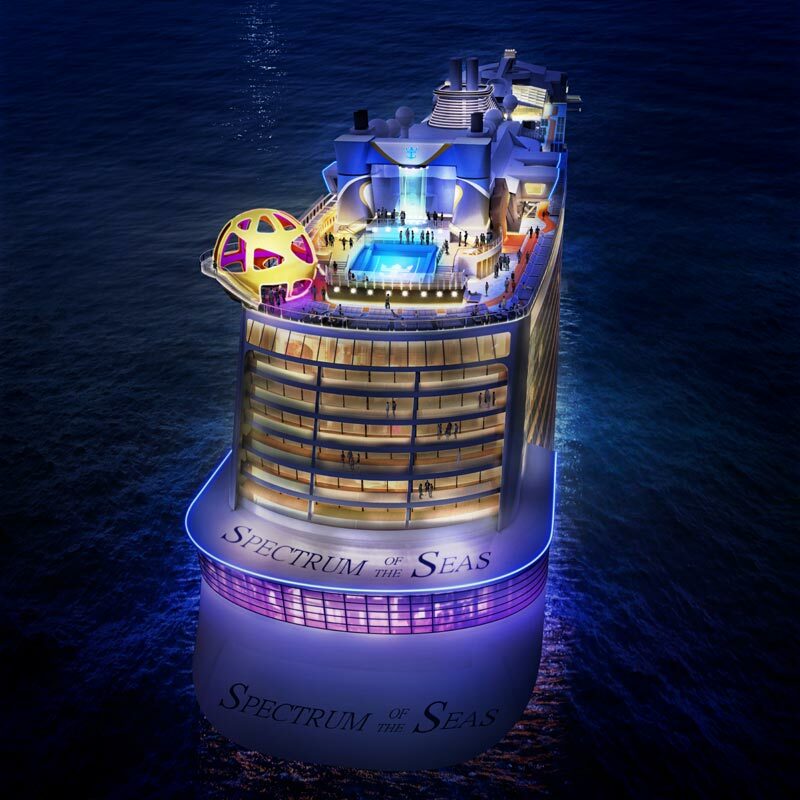 The next new Royal Caribbean cruise ship named Spectrum of the Seas is going to continue the trend with new features and experiences for a new class ship. The cruise line has unveiled some major new things about the upcoming vessel which we’ll take a look at below. The excitement is building for the upcoming Spectrum of the Seas which will be the first Quantum Ultra class cruise ship for Royal Caribbean. The ship will be an evolution of the current Quantum-class ships and purpose-built for the Chinese market. The cruise line will introduce new fleet first features and enhanced ones already seen on other Royal Caribbean ships. The first Quantum Ultra ship will debut Royal Caribbean’s first exclusive suites-only area, which will feature the exquisite Golden and Silver suite accommodations in a private enclave at the forward end of the ship on decks 13 through 16. Vacationers booked in these luxury suites will have special keycard access, a private elevator and a dedicated restaurant and lounge. In addition to a range of exclusive amenities, guests will have access to The Balcony – a private outdoor space for sunbathing and relaxing – that offers the best views on board; and The Boutique, a shopping area where travelers can book private shopping experiences. 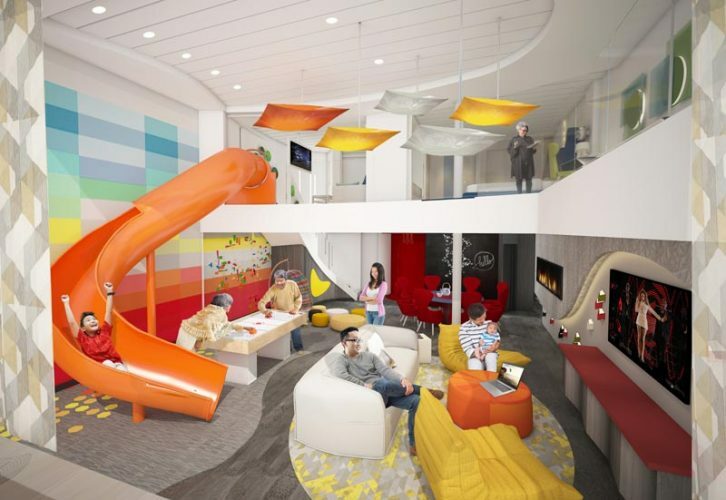 For families that want to experience more quality time together, Spectrum of the Seas will introduce the two-level, 2,809-square-foot Ultimate Family Suite, accommodating up to 11 guests. The three-bedroom suite, which will include a master bedroom with a bathroom that extends over the side of the ship to provide unparalleled ocean views, along with two additional suites for grandparents and other family members. Kids have their own kid-friendly space on the upper level, complete with an in-suite slide that will transport them to the living area below. Everyone in the family can enjoy time together in the recreation room, featuring surround-sound equipment for a night of karaoke, movies or video games. Sichuan Red will be a new specialty dining venue where guests can enjoy authentic cuisine from the Sichuan province of China. The restaurant will be located in the Royal Esplanade. 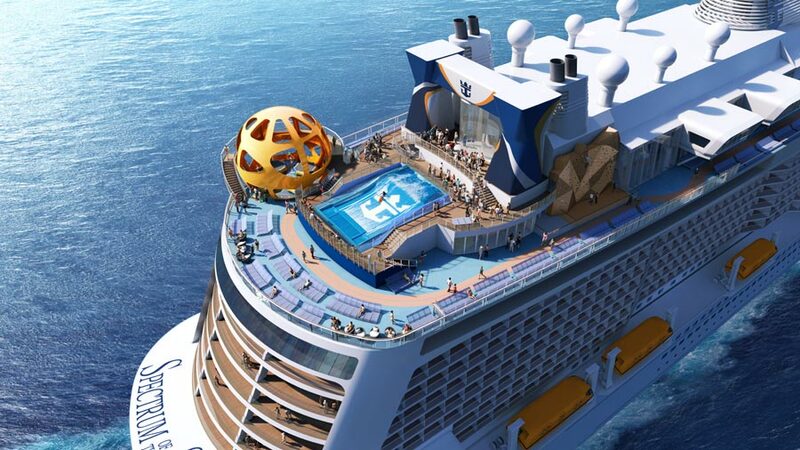 There are so many things which will be on the ship which can already be found on other Royal Caribbean ships. Popular venues including Jamie’s Italian, Izumi and Chops Grille will be onboard. there will also be a new Leaf and Bean venue with a traditional tea room and cafe. A new karaoke venue is being featured on Spectrum of the Seas because Chinese love singing which is known as KTV. Family and friends can sing together and become their own stars! Spectrum of the Seas will be based in Asia from June 2019 after her 51-night Global Odyssey from Barcelona, Spain departing in April 2019. The new ship will feature 27 unique itineraries, featuring 23 destinations across three countries, departing from ports such as Shanghai, Tianjin, Hong Kong and Shenzhen, China. At the moment she’s being constructed at the Meyer Werft shipyard in Papenburg, Germany. Once complete the first ship in her class will accommodate 4,246 guests at double occupancy and 1,551 international crew members. Cruise Hive will continue to keep readers updated on this exciting new cruise ship for China.